It’s been four years since the debut of the PlayStation 3. Four years that have been one hell of a ride filled with great promise, embarrassing moments, and stupid decisions. Thankfully, it seems that Sony’s gaming platform has haphazardly found its way. Whether “how successful” is another argument to be made; what I want to focus on is the E3 event which started that strange journey. E3 2006. Before a crowd of media correspondents and journalists from publications far and wide, Sony unveiled its third iteration to its gaming console series – the PlayStation 3. Most historians would mark this event as Sony’s downward spiral complimented with foolish arrogance and constant stupidity. And they are so dead on that even I, a full-time internet white knight, can’t sugar coat it enough. This precious keynote is one of those unexpected hilarious moments that show how the King can quickly become the fool in no-time-sharp. 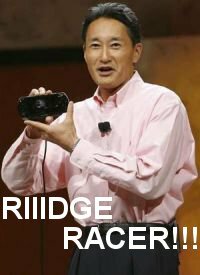 Not only did you have Sony’s CEO Kazuo “Kaz” Hirai, shock the crowd by announcing such a laughable $500 price point, but later he would utter the phrase that would become one of the most famous internet memes known to modern gaming. And if that weren’t the icing on the cake, the presentation of Genji: Days of the Blade, featuring a giant crab battle (hehe), made the entire event seem like a huge prank – as if pretty-boy Ashton Kutcher was waiting to jump out and quickly point at the hidden cameras to the crowd present. Yes after the last Ridge Racer for the PSP there will be a new Ridge Racer game, but not for the platform you think. Announced today was Ridge Racer Accelerated for the Apple iPhone. If there wasn’t any more given reason to hate people with iPhones, this might make me want to instantly chain-whip anyone I see that flips one out. But something is better than nothing for this really awesome arcade racing series from Namco-Bandai. In other awesome links of the day action: are Sony’s three big pillars of 2010, Andy Richter from The Tonight Show admits he was snubbed by the Video Game Awards for best voice acting performance, Dan “Shoe” Hsu’s disturbing tale of how his Xbox Live account was stolen, and Nintendo trademarking “Zii.” Oh lordy! Sounds like some juicy stuff to read!